Brands A-Z Ancient Secrets, Lotus Brand Inc.
By Ancient Secrets, Lotus Brand Inc.
- As seen on The Oprah Winfrey Show. 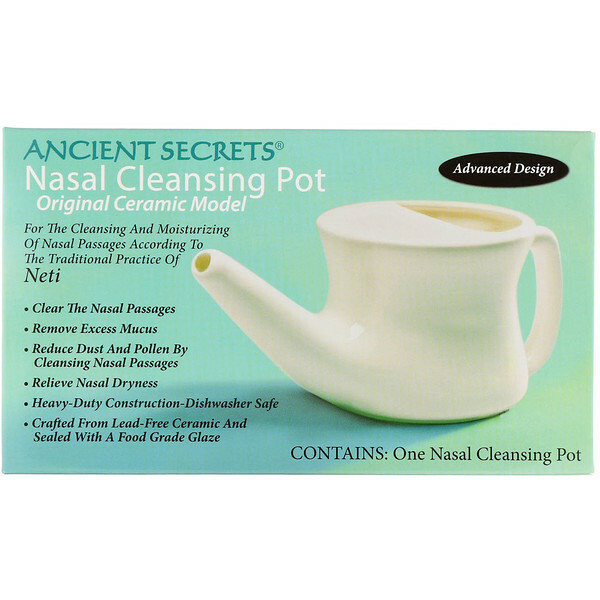 For the Cleansing and Moisturizing of Nasal passages according to the traditional practice of Neti. Useful for removing dust, pollen, excess mucus, and other irritants. Soothing and moistening to dried out nasal passages. Traditionally used as a purification exercise for the practice of yoga. Prepare the Saline Solution per instructions. Fill your clean, dry Nasal Cleansing Pot. Practice the process over a sink or basin. Tilt your head to the side as shown. During the cleansing process breathe through your mouth. Insert spout of the Nasal Cleansing Pot gently into the raised nostril creating a seal between pot and nostril. Raise Nasal Cleansing Pot slowly to develop a steady flow of saline solution in through the upper nostril and out of the lower nostril. Upon completion of the process, exhale gently (through the nose) several times to clear the nasal passages. Reverse the tilt of your head and repeat the process on the other side. Thoroughly clean and dry Nasal Cleansing Pot. Use only clean, lukewarm water that is distilled, sterile, or previously boiled. As with your toothbrush, do not share your Nasal Cleansing Pot with others. Thoroughly clean and dry Nasal Cleansing Pot after each use. Children using this product should be aided by a responsible adult. Stop use and contact your physician if you experience pressure in your ears during use, or if you experience fever, headache, nosebleed or any prolonged discomfort after use. Do not use if the ceramic or glaze is chipped, cracked, or broken. Are currently suffering from any disease or illness. Have a chronic illness or health condition. Have a new or acute ear infection. Are unable to blow your nose.